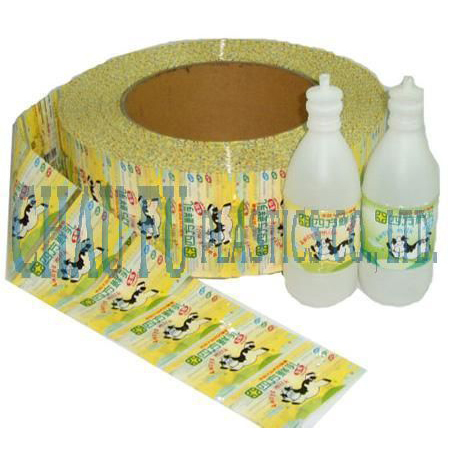 PET Shrink Film & Shrink Label (Shrink sleeve & bottle Label)(PET Shrink Film & Shrink Label) - Chau-Fu Plastics Co., Ltd. The shrink sleeves & labels by the mean of heating averagely can fit various bottles. Using shrink labels provides an opportunity to decorate the container with some very eye catching designs. It also provides more printing space for promotional and brand reinforcing messages since the label can be printed the entire 360 degrees. Applicable for any kind of packaging such as drinks, soft drinks, medicines, milk, instant noodle, soy-bean source, bread, food product, cleansing product, glass bottle, iron can, and various containers packing.